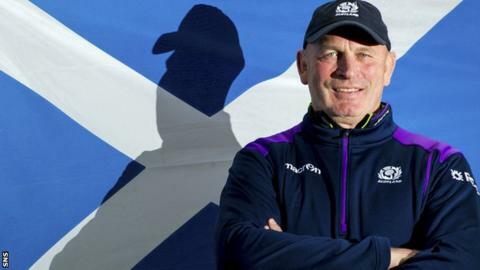 Scotland stand-off Duncan Weir has praised the impact "world class" head coach Vern Cotter has had on the national side. New Zealander Cotter guided the Scots to wins over Argentina and Tonga, and a narrow defeat to the All Blacks in the autumn Test series. "He leads the teams into battle," Weir told BBC Scotland. "When he talks you listen and you take it on board and you learn because you have such respect for the man." The 37-12 triumph over the Tongans at Rugby Park on Saturday capped what was widely regarded as an excellent series from the Scots. Praise has been piled on Cotter and his players for the performances and Weir believes it is richly deserved, having relished the chance to work under the Kiwi. "The way he approaches the game plan and individuals is world class," Glasgow star Weir added of Cotter, who officially took charge of Scotland at the start of the summer. "We've brought that pride and sheer determination to succeed for a whole nation, not just yourself and your family." "It's a great environment to be involved with and it's one I'm very proud to have played a part in. "He wants us to go out and play and express ourselves, and that is a great thing as a player collective, that we've got the belief of the coaches and that he'll back our decisions on the field 100 per cent if we have good reasoning behind it, and we're in the structure that they set. "We're in a good place. We've got a strong squad. I'm very happy with the effort and the pride that's back in that jersey. Weir showed up well when called upon during the autumn series, and he revealed he is enjoying the competition for the number 10 shirt with club team-mate Finn Russell. "I really like to have that player battle," he added. "It's a good thing and it's going to make you strive to play your best rugby. "It's not just me, it's 14 other guys who have strong competition for the Scotland jersey and at club level here at Glasgow. "That's a good thing for Scottish rugby and it's going to drive each individual player forward, but also the nation as well."